She'd been waiting for the information for months. When it arrived, in a plain brown envelope, she cried for three days. Ivy Sucee's father, Fred Roberts, had died in 1967 believing his mother was an English prostitute who had abandoned him at an orphanage. But decades after Mr. Roberts's death, Sucee learned the truth in those white, typewritten pages. Her father was born in England in 1888 and lived as a newborn with his mother and father. His mother died of tuberculosis at age 21, when he was still a baby, leaving him in the care of his father and maternal grand- mother. His father left him with his grandmother one day, claiming to go looking for work, and was never seen again. Mr. Roberts' grandmother cared for him until he was two years old before she became blind and turned the toddler over to the Dr. Barnardo Homes - a system of homes to care for orphans and street children. "Wouldn't I have loved to tell Daddy about his own history?" says Sucee, welling up with tears in her Waddell Avenue home. "To tell him he did have a family after all." After reading her father's history, sent from Bamardo's (still an active children's charity) about 10 years ago, Sucee went to Rosemount Memorial Gardens to visit her father's grave. "I read him every word," she says. Sucee may not have been able to tell her father about his biological family while he was still alive, but the 74-year-old has devoted the last decade to making sure other Bamardo children, and their pendants, know their roots. There are many Canadian descendants because thousands in the Dr. Bamardo Homes were sent to Canada in the late 19th century as part of an overseas program to place the children with families here. Sucee says one-third of all the children sent to Canada came to Peterborough, to stay at a Barnardo home known as Hazelbrae. Sucee is a petite, bright-eyed, gentle woman given to folksy expressions. "Good gravy, it's a nice day out," she exclaims in a recent interview. But when talk turns to her Bamardo volunteer work, she becomes emotional and tears are never far away. Her eyes widen and her voice and passion rise to the point where she literally thumps the dining room table for emphasis. "I feel privileged to do what I do because people need to know where they come from," she says, that clenched fist on the table, "We all have a right to know where we come from, good or bad, rich or poor." Sucee's father was born July 10, 1888 in Queen Charlotte's Hospital in London, England, and was admitted into the Bamardo Homes at age 2 1/2. The homes, funded by donations, took in children who had been living in poverty on the streets, sleeping in chimney tops or in the gutter. At the time, London was coping with the Industrial Revolution: The population had dramatically increased and the area was rife with overcrowding, bad housing, unemployment, poverty and disease. The motto of founder 'Dr. Thomas John Bamardo, an Evangelical Christian, was "No destitute child refused." "So many died, over there. so many children were lost," Sucee says. By the late 19th century, with the homes busting at the seams, Dr. Bamardo worked with the Canadian Department of Agriculture to arrange for children to come to Canada to live with families and help on farms. About 30,000 children came over between 1869 and 1939, Sucee says. Others, such as her father suffered through nightmares. Mr. Roberts, at age 10. boarded the S.S. Dominion for a 40-day journey across the Atlantic Ocean and wound up on a family farm in Huntsville, Ont. He would later tell his children how he was beaten by the family, lived in the barn and always felt "half-starved." "He felt the dog was better fed than he was," Sucee says. After a year there, Bamardo's moved him to another farm in Arthur, Ont., just west of Orangeville, where he suffered extreme physical abuse. When Sucee would rub her father's back in his old age, she says she could still feel how his bones hadn't healed properly from the beatings. Mr. Roberts was taken to other homes including in Princeton, Ont. but Sucee says he was a small, fine-featured man who couldn't handle much of the demanding farmwork that families wanted. He was taken back to a Barnardo home in Toronto where, at age 14, he finally met Harry and May Watkins - a couple who took him home to raise him and treated him with love and respect. May Watkins, a retired schoolteacher who always said she loved Mr. Roberts upon first sight, called him "my Fred." Mr. Roberts was raised by the Watkinses in Ardock, Ont., near Kingston, and when old enough, worked any job he could find, including in northern silver mines and on farms. He eventually married Effie Blanche Teeple and the couple moved to Peterborough in 1921, where Mr. Roberts worked as a manager at Bredin's Bread on London Street. Ivy was born on April 23, 1933 in her childhood home on the corner of Charlotte and Aylmer streets where Shoppers Drug Mart now stands. Perhaps still smarting from his belief that he was the abandoned son of a prostitute, Mr. Roberts drilled his motto into his children: "No child can help the circumstances of their birth. They're defined by what they do with their life afterward." He was a gentle father whose disciplinary style consisted of raising his index finger to instruct his children to behave. Sucee recalls a happy childhood, although there was never much money as the country suffered through the Depression. She remembers playing with neighbourhood children, including her next-door-neighbour George Elliott, now a noted local artist. Sucee attended Prince of Wales Public School and PCVS. She left school after grade 10 to work in the regulation and packing department of Westclox because she needed to help support the family after her father became ill with appendicitis, which was complicated by diabetes.He later recovered and worked as a labourer at General Electric. At 17, Sucee got serious with her childhood sweetheart, Morley Sucee, and they married days before her 20th birthday. Sucee was a homemaker and her husband drove a horse and cart as a deliveryman for Brown's Bread and also worked at Sunshine Dairy. They bought their first home on George Street before moving to a farm in Stewart Hall, just outside the City in Otonabee-South Monagham. They had three daughters: Carol, Lynda and Sheila. The couple eventually owned Kawartha Fuels and later Trent Fuels, which delivered oil and gas to homes and businesses and installed furnaces and air conditioners. Tragedy struck in September, 1980. Their 18-year-old daughter, Sheila, who had been studying at Sir Sandford Fleming College and planned to become a veterinary technician, was driving three people home from the drive-in movies when the car struck a tree. The three passengers were injured; Sheila died. Through more tears and shaking of her head, Sucee explains that a witness to the accident told her Sheila hadn't done anything wrong. The car had caught the road's shoulder and gone out of control. "We all (in the family) worked together to cope," Sucee says. "It was just so hard on us." They moved on as best they could. Morely eventually retired to the cattle farm in Stewart Hall. Sucee had always been interested in her father's Bamardo history because he had talked about it so much. "He talked about all the good and all the bad," she says. "He said he had joined the First World War army because this country gave him a chance to have a life." In 1995, however, her involvement revved into high gear. 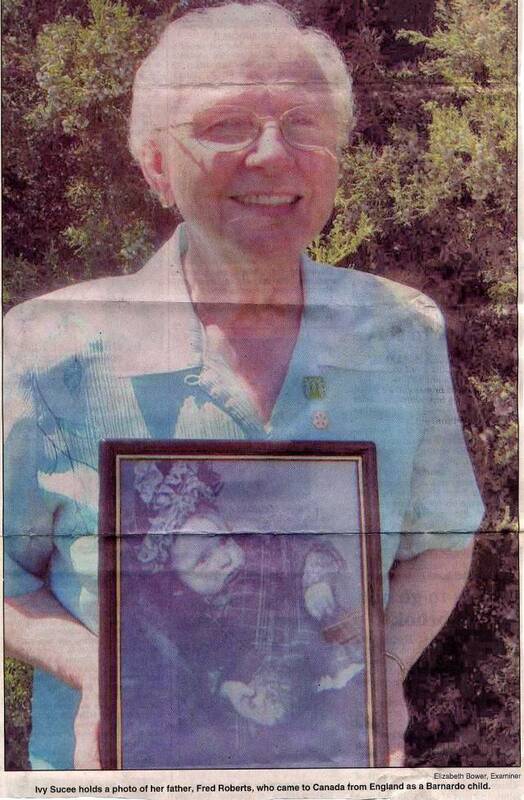 She attended a meeting for Bamardo children and their descendants at the Peterborough Centennial Museum and Archives. She later got a phone call from Bamardo's asking if she'd be the representative for this area. She agreed in a heartbeat. As part of this volunteerism, she takes speaking engagements, visits descendants who have questions or concerns and helps find family records. She says she has helped 363 people get their family records. She also meets bi-monthly with 80 other members at Northminster United Church as part of a support group. The group raised $1,300 to get a plaque to mark the site of Hazelbrae. Her work has earned her several awards including a Peterborough Historical Society Heritage Award in 2000, Bamardo's Volunteer of the Year in 2001 and the Paul Harris Fellow, from the Kawartha Rotary Club, for promoting better understanding of people across the world. It was through her role with the Bamardo group, and learning more about how to access records, that she was able to find the information about her father, who had always believed his mother was a prostitute because that's what one of his placement families had told him. Shortly after she joined the group, her husband Morley was diagnosed with Alzheimer's disease. Over the years, she took on more of a caretaker role with him as his condition deteriorated. After 53 years of marriage, in August, 2006, he died of a heart condition. "There wasn't a man who was loved more," she says, again wiping away the tears. Since his death, Sucee has tried to put her energy into the Bamardo group to help tope with her grief. Her office is full of books on Dr. Bamardo and contains a fire-resistant filing cabinet stacked with documents. Today, Sucee's devotes much of her time and effort to petitioning people for donations to raise $50,000 to pay for a monument at Little Lake Cemetery bearing the, names of all 10,000 children who ! lived at Hazelbrae. Sucee's group has raised just more than $20,000 so far, mostly at $5 or $10 at a time. Sucee says it's important for her to document the history of Barnardo children. Fist again clenched and her voice rising, she explains why: "They were the backbone of our country, the labourers on farms who helped clear land and work the fields. .. at one time, 11.5 per cent of our population were Bamardo children," she says. "And you can't name a profession that a Bamardo child hasn't been in - from heads of universities, to doctors, nurses, ordinary clerks in stores and farmers." She says she fears future generations will never know their stories. "That's why I work so hard at it," she says.